That is it for today, thanks for following the action. We're back for final practice on Thursday morning followed by the three races that evening - the Supersport, Supertwin and Superstock. There is a five-race programme on Saturday. Stephen Henderson: What did @weewizard34 [Alastair Seeley] have for lunch? Jumps into P1 with a blistering lap - 4.5 seconds faster than @deanharrisonTT. Andy McLaughlin: Good to see the weather is picking up. Don't see past @weewizard34 for this year's podium. Tyco BMW rider Alastair Seeley is fastest in the closing Superstock session with an average lap speed of 118.306mph and must fancy his chances of adding to his 12 North West 200 wins later in the week. "He might have a target on his back - but they are not going to see him because he is so far ahead." Alastair Seeley is fastest in three of today's four qualifying sessions. Jennifer Casey: Watching North West 200. Fond memories from childhood. Remembering Mark Young this week. 6 years on. Gary Millen: Heading home to Portrush tomorrow for the NW200, will bring some better weather with me! Northampton's Maria Costello MBE is back on the grid at the North West 200 for another year. "You have to come to the North West 200. The welcome I get here is amazing and the fans are great. I've just got to be here." The rain has passed and the circuit is drying out quickly, so the final practice - the Superstock - should be the fastest of the day. Stuart Andrews makes an emotional return to the North West 200 races where his son Simon lost his life last year. Worcestershire rider Andrews, 29, died two days after crashing during the Superstock race in May 2014. The 'Wee Wizard' Alastair Seeley is also top of the charts in the Superbikes practice session - so our opinion poll was a bit off the mark! The vote winner Guy Martin had the 10th best time. The riders have full wet tyres on as it is pouring here with the Superbikes session getting under way. The forecasters predict better conditions for Thursday's practice and racing and also for the main race programme on Saturday. Let's hope they are right. "Hi guys, great coverage as always. Have you got a new hut this year without leaks?" Alastair Seeley has posted the best time in the first Supersport qualifying session with an average lap speed of 104.04mph. Michael Dunlop is next best on 103.40 and his brother William on 102.88. Lincolnshire's Guy Martin has topped the poll for the rider you think will be fastest in Superbike qualifying today. He got 30% of the votes, with Michael Dunlop next best on 27% and Alastair Seeley third on 15%. The voting on our poll has closed and we will shortly reveal who you think will post today's top Superbike time. French rider Franck Petricola is back at the North West 200 despite suffering life-threatening injuries during a practice crash here last year. Petricola, 32, suffered multiple fractures and a head injury and was in a coma for several days. "I was thinking about my accident before my first lap but not any more. "I am very lucky. It is my birthday so it is a great day." Seasoned campaigner John McGuinness is shaking his head as the bad weather closes in. "It is just a shame. I'm gutted for everybody because there is always so much enthusiasm in the build-up to the week. It is blowing a gale and we have to get the wets on," the 43-year-old from Morecambe tells Radio Ulster. A blustery shower is making life tricky for the Supersport riders as they go out for their practice session. "They could well come in for a change to wet tyres," says commentator Steve Parrish. You've 30 minutes left to tell us who you think will top the list of today's Superbike qualifying times, using the voting buttons on the right. Alastair Seeley, who scored a hat-trick of wins in 2012, has the overall record in his sights. "We're hoping to get a dry run and put a good show on for everybody," says the 35-year-old from Carrickfergus. The newcomers are now out on the circuit with a few spits of rain in the cold air. Northern Ireland rider Glenn Irwin, a leading competitor in the British Supersport Championship, is among those sampling the action. 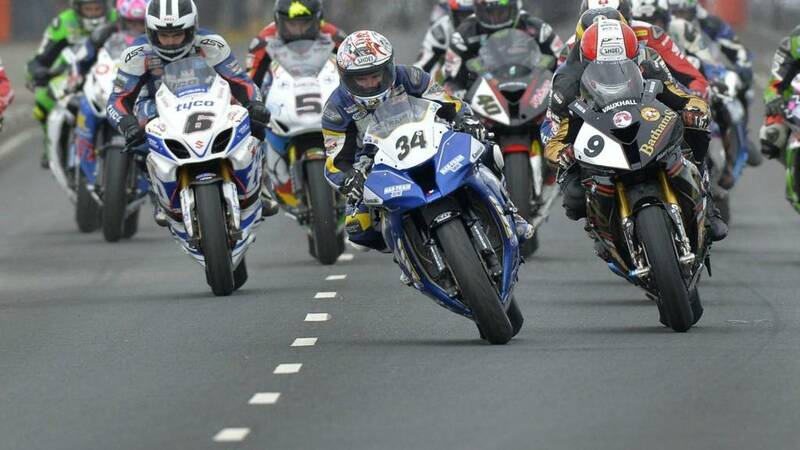 "There is a lot to learn about the wind at the North West 200," says Phillip McCallen. He should know - the BBC pundit holds the record of five wins in a day. Voting closes at 11:15 BST. Video streaming of today's practice session starts on the BBC Sport website at 10:00 BST, along with Radio Ulster's coverage which is on medium wave and the website. Welcome to the 2015 North West 200 where it is overcast but, most importantly, dry. The riders will face windy conditions as they try to post competitive qualifying times. There is another practice session on Thursday but, with aggregate times counting, the riders need to be quick out of the blocks today.